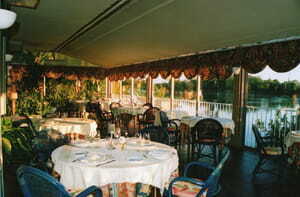 French South west style cuisine with grilled duck or beef, nice view on the lake. Saint Germain de la Rivière : A 5' drive from la Vieille Chapelle. Phone: 05.57.84.44.50 web site: Chez Carles. On the Isle river bank, in Fronsac, a really charming place with traditional and generous cooking. In Fronsac : a 15' drive from la Vieille Chapelle. From May to September. You can eat late in the night there. Phone: 05 57 25 13 70 Web site. Baywindow on the Dordogne river, fresh products cooked with style.